Hard to know what to make of this given the lack of other data, but I�m definitely unimpressed by the viscosity. This bike is my daily driver on my 65 mile one-way commute so it sees virtually all highway time. The oil was in service for about 6 months. I�m running M1 V-Twin during this next interval so we�ll see how that compares in a couple months. I�m gonna try ~6000 miles again. I'd suspect fuel is to blame for the viscosity depression and not the lubricant given the low flashpoint. Flashpoint should be closer to 400-420. I wonder why I'm getting such significant fuel dilution. I do very little stop-and-go type of driving, which as I understand it, is the main culprit for that problem. I guess time will tell! i think the better question is where is that much aluminum coming from? I agree, acknowledging that I don�t have much familiarity with H-D�s engines. Hard to say! Certainly this is a new engine still wearing in, but it�s hard to put a finger on it without comparison data. Well see at the next interval. Could definitely be too soon to expect normal wear metal amounts. No call to be made there. Just have to watch those levels. FD could maybe be from blowby as the engine is wearing in? Doesn�t this one share the engine oil with the trans and clutch? I dont see anything terribly wrong with your UOA, 6000+ miles on a new engine with the same oil and it shares it with the transmission no less. Not exactly stellar looking UOA but hard to say, engine so new and mileage so high on the oil. To me, viscosity is more then fine, nothing wrong with it in my eyes. Fuel? Well, fuel can be a funny number, sometimes its more the person taking the sample for the UOA then the oil itself. Was the oil burning hot when you took the sample? If not, its supposed to be. Now for the "fine print". Im biased against Red Line oil for no other reason then Im not sure why people spend that amount of money on it, when, for me, I know, I would turn in as good or better UOAs with $5 a quart conventional Valvoline motorcycle oil (or any other) and think my engine would be better off (and your case transmission too) by changing it sooner. But that is me, we all do what makes us happy with our bikes. Maybe better said, I just dont buy the whole Red line marketing thing but I know others who love the stuff and most likely for good reason, we all do what makes us happy. Nice bike by the way, good luck with it. Last edited by alarmguy; 06/16/18 11:03 AM. Harley Davidson engines are known for shedding a lot of metals during break-in. What ever you do if the next sample is an improvement don't go and claim that the Mobil One performed better because you don't know, any improvement will be the engine breaking in and shedding less metal. I wish you would have stuck with the Redline 20w-50 for a couple more oil changes so that you could track the progress, by switching oil brands you will now learn nothing from the oils. By the way I use Redline oil in my wife's 2016 Honda Civic 1.5 Turbo, my 2016 Ram 2500 6.4 Hemi and my 2018 Yamaha Star Venture Transcontinental. 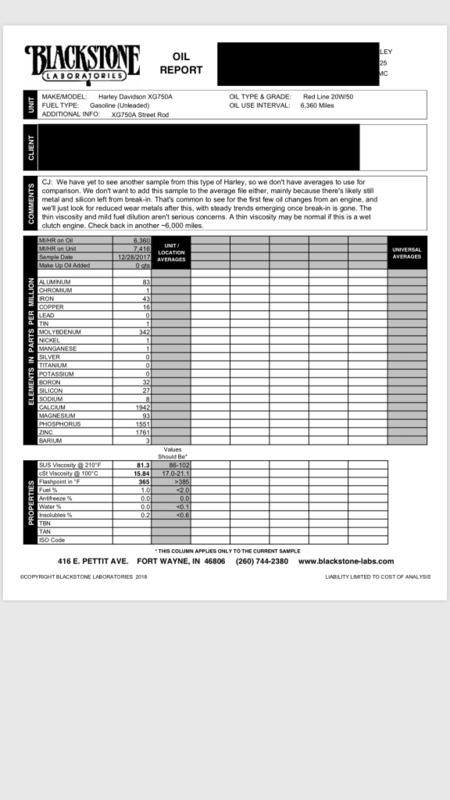 I used Redline 20w-50 motorcycle oil in my 2016 Harley Davidson Ultra Limited Low which is not a shared sump engine and the Blackstone lab report came back with lower than average metals in the oil. I know Redline is a proven performer, and I do not mind spending the money for it. Last edited by RedVic; 06/16/18 01:18 PM. My Harley V-rod would shear the OEM oil to water in 1,000 miles. The Red line was still good at the 3,000 mile interval I chose to use. BTW, Red line instructs that you shouldn't use their oil until after break in of 2,000 miles I believe. Why are you conducting 6300 miles oil change intervals on a Harley? According to the Report it was 6360 miles on the oil, not 5300??? Last edited by rossn2; 06/25/18 07:07 AM.